"Dedication ceremonies at the Adolph Leuzinger High School in Lawndale, a unit of the Inglewood Union High School district, were attended by 1200 persons last night, who, under the leadership of J.R. Wimmer, trustee, joined in the following dedication declaration: "We, the mothers and fathers, students and friends of the Adolph Leuzinger High School, in the presence of the Supreme Architect of the universe, hereby dedicate this Adolph Leuzinger High School to the present generation, and to posterity." "It is named in honor of Adolph Leuzinger, who has been a member of the (Inglewood Union High School District) board of trustees for twenty-five consecutive years. Leuzinger's long enduring, unselfish and sincere devotion to the cause of public education was honored by many feeling tributes. "It is too often," said Judge Leonard Wilson of the Superior Court in his address to the immense gathering, "that men must die before their rewards and their merits are inscribed so all may see. It is for this reason that I am particularly pleased to participate in a program which honors a man now living, Adolph Leuzinger."" 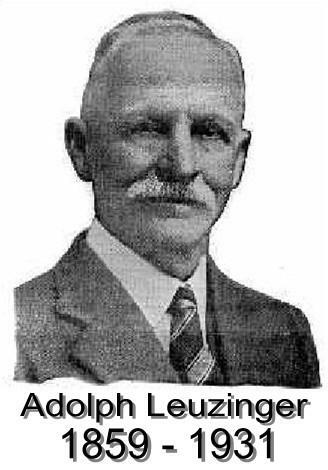 Adolph Leuzinger died on August 19, 1931. One of the finest monuments to Mr. Leuzinger's life of service is the school building on Rosecrans Avenue which bears his name. He and Mrs. Leuzinger were present at the laying of the cornerstone bearing the words, "Adolph Leuzinger High School," carved on its granite surface, and many who witnessed that ceremony were glad that Mr Leuzinger was honored during his lifetime, and in a manner appropriate to his modest and retiring nature.